This book is available in a few different editions, this one published originally in 2015 is a slightly edited version of the 1945 original. Another edition has a subtitle 'Lessons on Cana and Calvary'. In the first chapter of this book Sheen states: "It is interesting that Our Lord spoke seven times on Calvary and that His Mother is recorded as having spoken but seven times in Sacred Scripture. Her last recorded word was at the marriage feast of Cana, when her Divine Son began His public life. Now that the sun was out, there was no longer need of the moon to shine. Now that the Word has spoken, there was no longer need of words." And he goes on to say: "Saint Luke records five of the seven words which he could have known only from her. Saint John records the other two. One wonders, as Our Blessed Lord spoke each of His Seven Words, if Our Blessed Mother at the foot of the Cross did not think of each of her corresponding words. Such will be the subject of our meditation: Our Lord's Seven Words on the Cross and the Seven Words of Mary's Life." 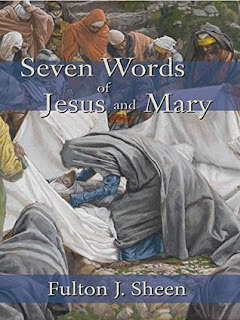 Then the book goes on to compare and contrast the seven times Mary speaks with Jesus seven phrases from the cross. The first section compares Jesus statement "Father, forgive them, for they know not what they do" Luke 23:34 with Mary's own 'know not' from "And Mary said to the Angel: 'How shall this be done, because I know not man?'" Luke 1:31-34. This book was an excellent read. The more of Sheen's writings I encounter the more I want to read. This is another excellent book that I highly recommend.